Due to the recent recession, many foundations and charities are struggling. Interest payments from investments are at an all-time low. Donors are wary of their contributions sitting in unsuccessful funds for the future, when they could be put to work through grants today. These factors lend urgency to the ever-present issue of sustainability among Third Sector organizations around the world. In this paper, Francesca Aguiar Carson investigates current trends, best practices and lessons learned from community foundations and diaspora giving organizations in establishing, managing, and cultivating donor support for an endowment within today's philanthropic and economic climate. Ms. Carson is tasked with developing recommendations for a suitable endowment strategy for BrazilFoundation, a grant-making and fundraising public charity with a young donor base which generates resources to support community-based projects across Brazil. The Foundation has invested more than $18 million over the past 12 years, mostly in comparatively small one-year grants, supporting the work of more than 300 social projects in Brazil. Ms. Carson draws on lessons from community foundations in order to gain perspective on how a public diaspora foundation like BrazilFoundation might best organize an endowment campaign. 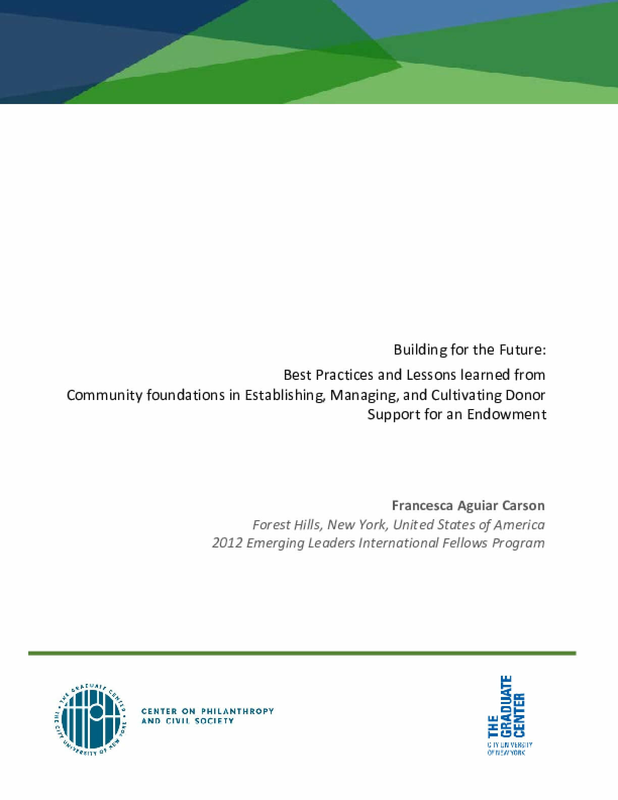 Ever aware of balancing the demands of short-term need and long-term planning, and drawing on lessons learned from community foundations in the U.S., Canada, and Kenya, Ms. Carson concludes that BrazilFoundation is an example of an organization that could benefit from developing and introducing a "soft" (or incremental) endowment strategy. The author emphasizes the importance of analyzing an organization's current capacity together with other factors that might influence an endowment campaign -- including knowledge about the age and cultural practices of a foundation's potential donor base. In her recommendations she also points out that long-term sustainability may be achieved through means other than endowment building, including social enterprise and annual fundraising campaigns for pass-through funding. Copyright 2012 Center on Philanthropy and Civil Society at the Graduate Center of the City University of New York.